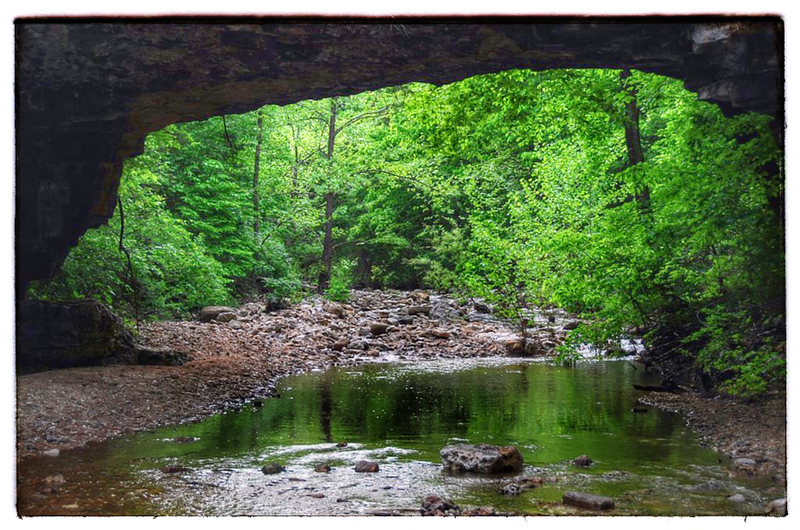 Whether you are staying at Campground during National Speleological Society Convention 2015, or a nearby hotel, the area offers lots of opportunities to get up close and personal with Missouri’s rugged Ozark Mountains. The City of Waynesville’s Walking Trail could also be called a River Walk. This easy trail begins in Laughlin Park at Roubidoux Spring and follows the banks of the Roubidoux under the historic Route 66 Roubidoux Bridge into Waynesville City Park. A favorite with locals, geocachers, and hikers, Bussmann Lodge is located in the Mark Twain National Forest in Pulaski County near the village of Devils Elbow, off of Temporal Road. Constructed as a family getaway on the Big Piney River for the Bussmann family of Saint Louis, the ruins of the property are publicly accessible by floating, four wheel drive, or hiking down the neglected access road. Historic details of the lodge have been lost to time- but local legends of mobsters and moonshine are colorful and plentiful- making Bussmann Lodge Pulaski County’s hidden Ha Ha Tonka. 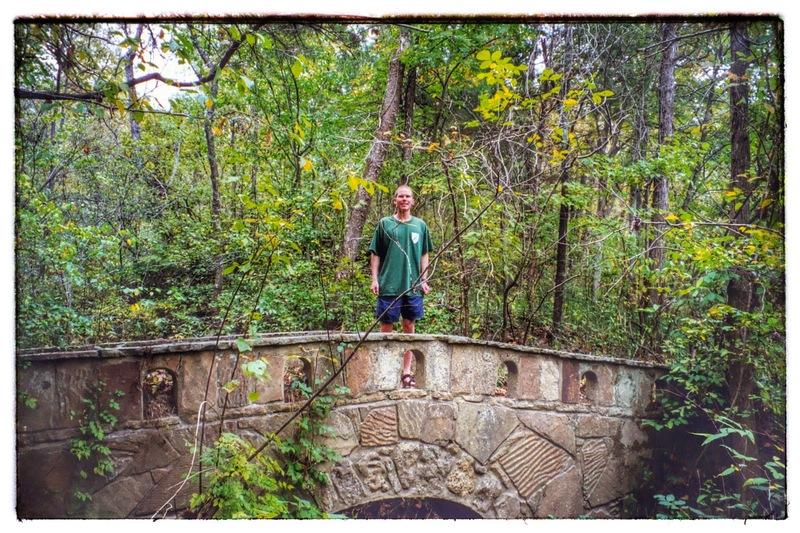 Conor Watkins at Bussmann Lodge Footbridge in Pulaski County, MO. Cole Creek Trail is primarily known as an equestrian trail although it is also open to hikers. The trail is comprised of two loops that equal 11 miles. The west loop is 4.9 miles long and the east loop is 5.3 miles. The connector is approximately one mile. The terrain is typical Ozark hill country and the trail is rated as moderate. 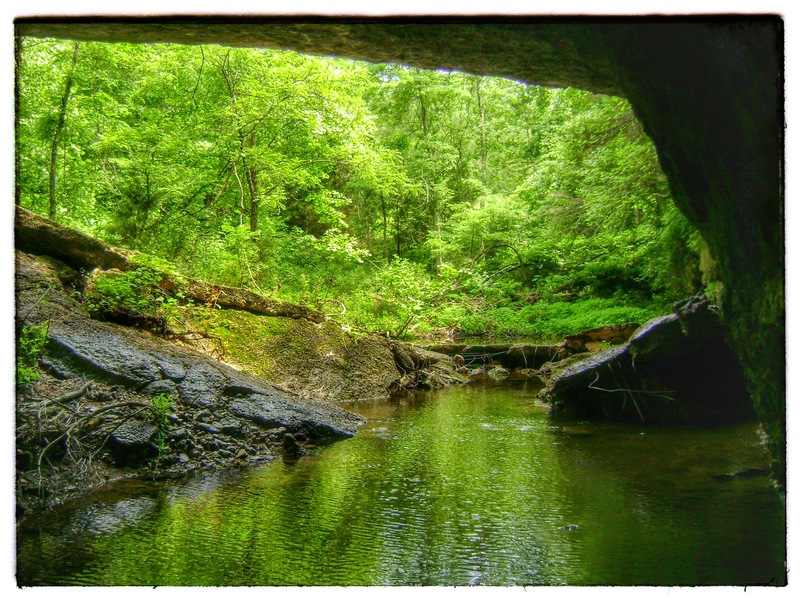 Coleman Memorial Conservation Area, in Laclede County, is home to Small Sink and Canyon Sink, which is a large, natural sinkhole. Canyon Sink is being restored. The area is also home to an easy, interpretive 1.80 mile trail. Kaintuck Hollow Trail, located in neighboring Phelps County, has 9 sections and 16 miles of looping trails that you can customize with lengths from one to fifteen miles. One of the systems most known features is Kaintuck Hollow Natural Tunnel, a 175 feet long tunnel, created when a cave system collapsed leaving part of the cave roof intact. Unfortunately, it is closed to public entry due to White Nosed Syndrome. Other natural features include Wilkins Spring Pond, Dewitt Pond, and the artesian well at Mill Creek Recreation Area. Wilkins Spring on Kaintuck Hollow Trail. Image by Conor Watkins. Big Piney Trail is a 17 to 18 mile moderate to difficult trail through the Paddy Creek Wilderness. Signs and trail markings are sparse, there are no bridges across the creeks, and the trail may be rough. Terrain is sometimes steep. Due to wilderness and primitive conditions this hike requires preparation. Multiple trailheads. A scene along Big Piney Trail. Photo by Charlie Wilcox. Paddy Creek Trail is a one mile loop trail beginning and ending at Paddy Creek Recreation Area which is nestled in a hollow along Paddy Creek. Marguerite Bray Conservation Area is located in neighboring Phelps County. Mrs. Bray donated 132 acres in 1995 in memory of her husband and their two sons. A scenic 2.5 mile loop hiking trail leads from the trail head west along the ridge top and returns along a wet weather creek bed. Although the trail is easy in most sections there are some areas of moderate difficulty, including a steep hill at the trail head. Along sections of the trail there are educational opportunities to learn about the plants and animals that inhabit the Bray Conservation Area. Marguerite Bray Conservation Area is home to an earthcache and Ingress portals/mission. Peter A. Eck Conservation Area, 12 miles northwest of Licking, in neighboring Texas County can be reached by canoeing or kayaking the Big Piney River, or via dirt road with a high clearance vehicle. This area includes an exemplary old-growth pine stand. This area has also been designated as an “Important Bird Area” by Audubon Missouri. The Eck Trail is a moderate one mile trail and hiking is also permissible on old logging roads in the conservation area. Located in neighboring Miller County, Brays Access is owned by Missouri Department of Conservation and offers 2+ miles of looping trails of forest and woodland habitats. 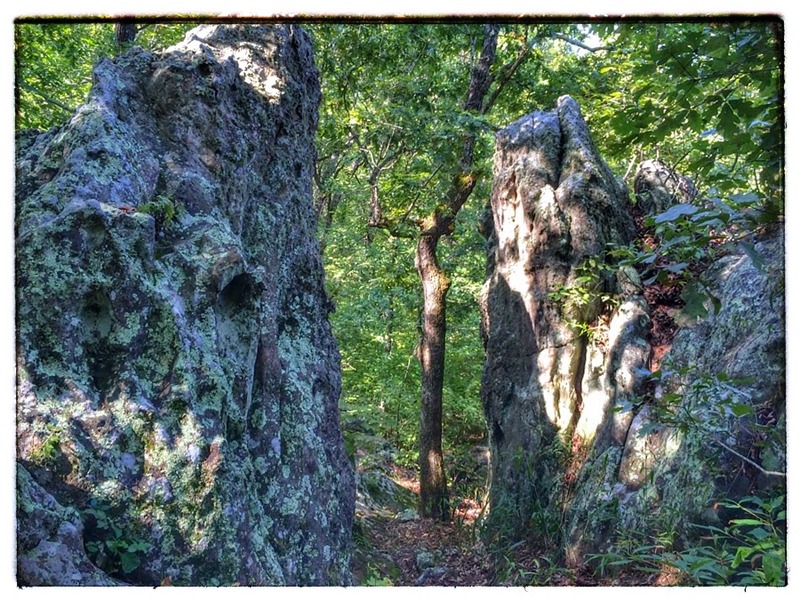 Rock formations and a wet weather creek add variety to your hiking experience. These trails are moderately rugged and interpretive signs are posted. Brays Access is home to a geocache. 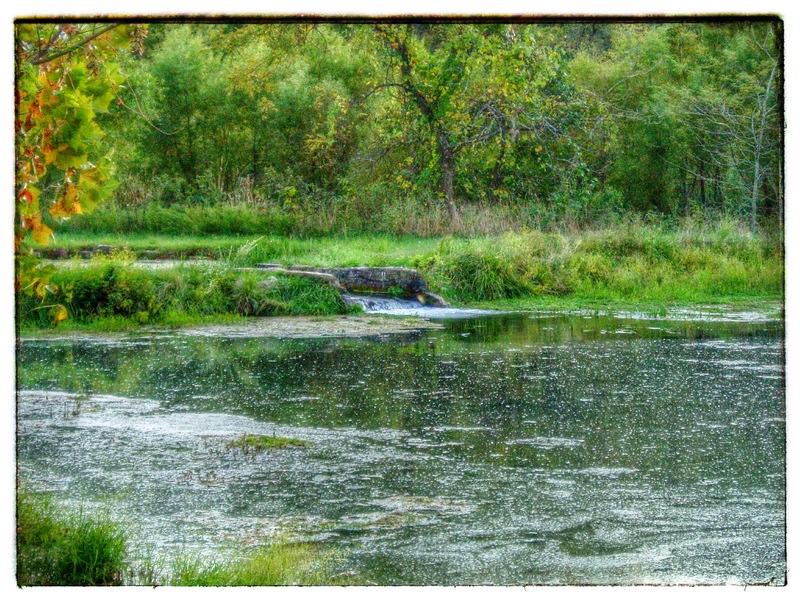 Located in neighboring Maries County, Clifty Creek is Missouri’s first designated natural area- deemed so in 1971. The area was described by G.C. Broadhead for Missouri Geological Survey in 1857. A very scenic 2.5 mile loop hiking trail leads from the conservation area parking lot to the natural bridge and back. 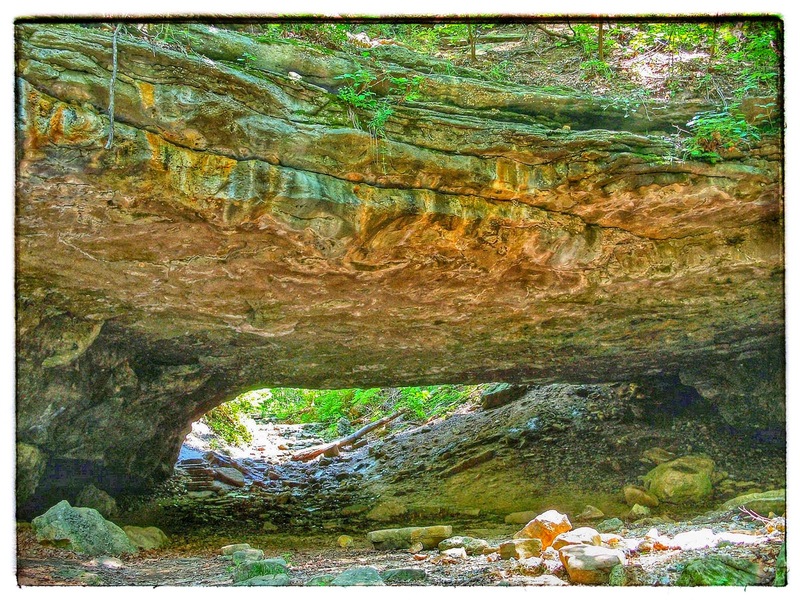 Clifty Creek Natural Arch is an outstanding example of stream piracy. The arch spans approximately 40 feet and is 13 feet high in a picturesque setting. Under the arch at Clifty Creek. Photo by Greg Wacker. Nine hiking trails for you to explore. The shortest trail, Bluestem Knoll, is less than a mile long. The 12.75 mile Honey Run Trail is a favorite of endurance fans and mountain bikers. A portion (.60 mile one way) of Fawn’s Ridge Trail is wheelchair accessible. Hidden Springs Trail makes its way past a small family cemetery of yesteryear and Shady Ridge Trail offers stunning views of the lake. Bennett Spring State Park, located in neighboring Laclede County, is most famous for its premiere trout fishing. The park features six trails with Natural Tunnel Trail being a favorite for day hikers. Natural Tunnel Trail is a 7.5 mile, moderate hike that leads to Bennett Spring Natural Tunnel. The trails namesake and signature feature is 296 feet long and forms an S curve through the hill. For the tapohiles, or tombstone enthusiasts, this trail passes near a small, family cemetery that dates to the 1800’s. The other trails in Bennett Spring State Park range from .30 to 2.5 miles with difficulty ratings from easy to moderate. Some of the trails have roots in prehistoric times while many date to the 1840’s. Bennett Spring Natural Tunnel. Image courtesy of Missouri State Parks. Camdenton Conservation Service Center, in neighboring Camden County, features a mile long Forest and Savanna Trail that includes a paved, disabled accessible section. This location also houses a 100 foot tall fire tower with a publically accessible viewing platform at 80 feet. Imposing architecture and breathtaking scenery combine to make Ha Ha Tonka State Park one of Missouri’s most treasured spots. Located on the Lake of the Ozarks, the park features the stone ruins of a turn-of-the-20th-century castle built by a prominent Kansas City businessman high atop a bluff. More than 15 miles of trails traverse the park, leading visitors to sinkholes, natural bridges, caves and down to the lake. Ha Ha Tonka Natural Bridge. Alice Ahart Mansfield Conservation Area is located in neighboring Camden County and features a .75 mile loop trail through forest area. Larry R. Gale Access is located in neighboring Camden County and is on the Niangua Arm of the Lake Of The Ozarks. This area includes a Forest Glade Trail, less than a mile in length, and rated as difficult. Blossom Rock Trail is located in Lane Spring Recreation Area in neighboring Phelps County. This trail is a mile loop and near the top of the ridge is Blossom Rock. Blossom Rock is a sandstone formation that appears to blossom forth from the surrounding limestone. 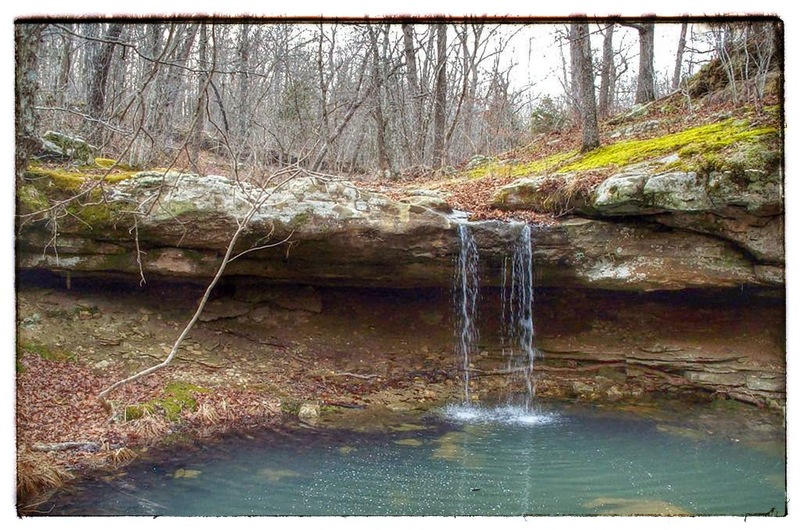 According to Geologic Wonders and Curiosities of Missouri this spot is “attractive for climbing and simulating Wild West ambushes.” While at Lane Spring Recreation Area you can also hike Cedar Bluff Trail. Blossom Rock in Phelps County. Photo by Laura Huffman. Cedar Bluff Trail is also located in Lane Spring Recreation Area in Phelps County. This trail is a mile and a half loop and is steep in some places. At the top is a rocky meadow, surrounded by cedar trees. At its highest point the trail offers scenic views of Little Piney Creek. Visibility may be limited by vegetation during the summer months. 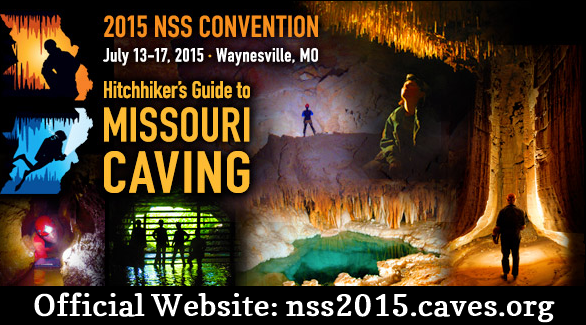 Register for National Speleological Society Convention 2015 at http://nss2015.caves.org/.